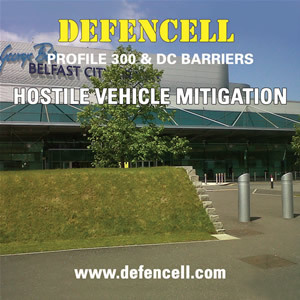 How to deliver people and assets as far forward in an area of operation as is physically possible is a problem that has long occupied military planners, in what in military parlance is known as ‘force projection’. It is a cliché, but the world is a very big place and the areas in which the military are required to operate, are so often, in some of the most remote and inaccessible regions of the world. Whether it is a hostage rescue, an anti-terrorist operation or a humanitarian mission, ‘getting there’ presents a real challenge ‘getting around’ another, and of course ‘getting back safely’, the ultimate challenge. Parachute insertion of both personnel, equipment and supplies is one answer. Developed by the military largely during the WWII, large and small-scale parachute drops have been used highly effectively for both military operations, and in more recent history, for delivering supplies for humanitarian relief operations. But parachute operations have some severe limitations. For military operations, parachute troops are necessarily lightly armed and once on the ground mobility over a wider area is limited by the number and type of vehicles that can be delivered by air. This is feasible for small scale special forces operations, but for most operations mobility will be limited by how far a soldier can walk with the load they can carry, therefore, dropping on or very near the intended target is key to success in airborne operations. For operations over a wider area, the problem of mobility remains. Then of course, there is still the problem of recovering personnel, equipment and possibly hostages, sick, injured or refugees to complete the mission. For disaster relief and humanitarian operations para drops remain an option because large loads can be delivered to remote areas very quickly, but because there is an element of risk attached to dropping supplies by parachute, both to the supplies dropped and to the local population, para drops are not favoured. This is where the helicopter has come into its own over the last half century or so. The helicopter is ideal for operating over a wide area over difficult terrain delivering people, equipment and supplies, as well as carrying out search and rescue operations and so on. But helicopters themselves have limitations, the chief one of which is their range. And the problem is a big one. Let’s take Africa for instance. The most common utility helicopter used by the US Marine Corps is the CH-53E Super Stallion operating from especially designed marine landing ships or aircraft carriers. The Super Stallion has a published range of 1000km or 500km round-trip. The distance at the two closest points between the Red Sea and the Gulf of Guinea is approximately 3448 km. That means there is 2448km between these two points of Africa that is unreachable by one of the US Navies most capable helicopters. If you draw a line 500km inland around the whole 26,000km of African coast it will leave approximately 2/3 or more of Africa outside the range of the Super Stallion. It leaves many whole countries, such as Niger, Chad, Central African Republic, Zambia, South Sudan and Uganda beyond the range of helicopters of any kind operating from a seaborne platform. The problem is an even bigger one when it comes to the Eurasian continent, with its land mass of over 55,000,000 square kilometres. The most obvious is finding a friendly refuelling stop on route to your intended area of operation, but for a whole variety of reasons that may not always be possible. Perhaps, extending the range of existing helicopter fleets by the addition of fuel tanks or by inflight refuelling? But adding additional fuel tanks reduces your capacity for other loads essential to the mission and not many aircraft are equipped for inflight refuelling and tanker aircraft are not widely available. Hybrids like the V22 Osprey have been developed and have been operational since 2007 but are still limited in range (approximately 800 km round-trip) and are extremely expensive to purchase and operate. If indeed the US were willing to sell them in the first place. Another more practical answer is to set up a forward operating base with a forward arming and refuelling point (FARP). This isn’t new. One of the most well-known operations of this type was Operation Eagle Claw, the failed American attempt to rescue the 52 US embassy staff held as hostages in Iran back in 1980 (in fact, it was this operation that led directly to the development of the V22 Osprey). However, despite the failure of that mission, the idea of setting up staging posts for aircraft to refuel for missions further forward is still one of the most practical. In Afghanistan, the US military regularly set up what are called “forward arming and refuelling points” (FARP) operations and even had dedicated units for the purpose. They also experimented with “jump forward arming and refuelling points” (JFARP’s) but as far as I’m aware these JFARP’s, inserted either by air lift or truck, were always in territory already controlled by the US military. 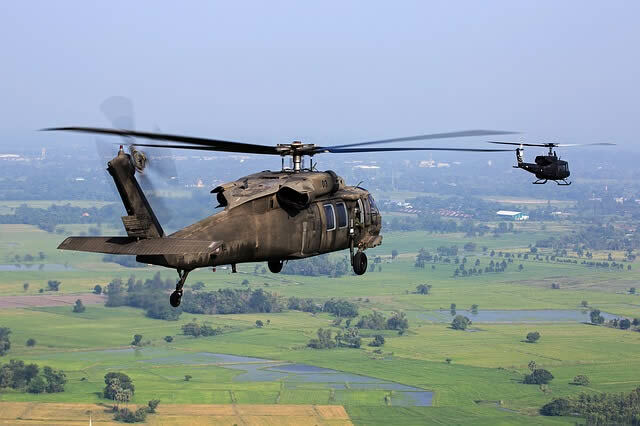 Whether it is a covert operation, as in the case of Operation Eagle Claw or an overt operation such as disaster relief, using the territory of a friendly government; preparing and equipping for such missions is something that has to be planned in advance if the right equipment is to be available when the need for such operations arise. Especially in the case of naval forces potentially thousands of miles from home base when called to act. One company that has given this issue some thought is FEC Heliports Worldwide, the UK arm of FEC Heliports Inc. in the US. Whether it’s for a covert or overt operation the first step JFARP operation will be to identify a suitable landing zone (LZ). So, for the sake of this article we will look at the more complicated covert operation scenario. Identifying a suitable covert forward operating base with JFARP will need to consider its proximity to local populations, routes in and routes out, is it defendable, dimensions, the topography and whether the ground type is suitable for helicopter landing. Special forces (SF) would be inserted to reconnoitre and secure the LZ. Once the green light for the operation is given, this is when the FEC package approach for the delivery of everything necessary for the deployment of a fully functioning JFARP would come into play. First special forces would mark the LZ using the FEC’s MIL-Star® portable battery powered LED lighting system. MIL-Star® has NVG compatible red, blue, green, white visible LED’s and infra-red which are pilot activated using VHF, operational at line of sight up to 10 miles and designed to support overt, covert and FLIR operations. Each light weighs less than 1 kg and a full case of 8 lights weighs only 10.6Kg. They are battery, solar or wind powered and can be left in place on the LZ in a passive mode for days or weeks until activated by the SF unit or the pilot during final approach. Where ground is undulating and uneven it may be advisable to use a portable helipad. 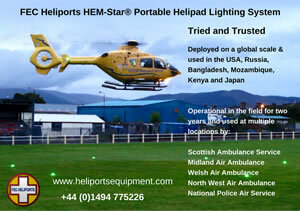 FEC’s PORTAPAD or ‘helipad in a box’ takes two men up to two hours to assemble, with little or no site preparation. Once assembled it provides an even, strong, safe helicopter landing platform that can be adjusted to the ground. It weighs only 2500kg and in it’s current of the shelf configuration is 9.15m x 9.15m – MTOW of Helicopter 6800kg and will therefore take a UH60 but it’s size can be configured to accommodate all but the very largest helicopters. The key requirement the operation is the fuel itself and this can be delivered by “Blivet”, which are collapsible Coated-Fabric Fuel Drums used to store and transport aviation fuels using a helicopter sling. They provide up to 2000L storage capacity with a loaded weight of 1700kg each and are already in wide spread use with US forces. There are of course many other bladder systems available for the purpose. Other equipment required would be a RB25A Hand / Air Portable Power Unit for aircraft starts (16kg). A fuel pump and nozzle with a 160LPM nominal flow rate (141kg) and finally a generator (30kg). All this equipment except for the MIL-Star® lighting (which would be deployed with the SF unit) can be delivered by a single Chinook helicopter and can be operational in a matter of hours and disassembled and withdrawn in the same timeframe.